site were extracted and subject to advanced laboratory testing at the Newcastle node of the CGSE. of the Chief Scientist and Engineer NSW, Coffey Geotechnics and Douglas Partners. characteristic values of material parameters that are based on incomplete field and laboratory data. prediction to asset owners and, therefore, must know the implications of their choice. the accuracy and reliability of numerical predictions of the behaviour of embankments which are constructed on the soft estuarine clays along the East Coast of Australia. Another key aim is to quantify the potential variability of these predictions by comparing them with the observed field response. Ultimately, it is hoped that the engineering profession will obtain a better understanding of the behaviour of complex soft soils, and thus be able to derive more cost-effective geotechnical solutions for the construction of transport and other infrastructure. for their contribution. All predictions have been included in these proceedings ISBN 978-0-9953750-0-0. Newcastle, Wollongong and Western Australia. 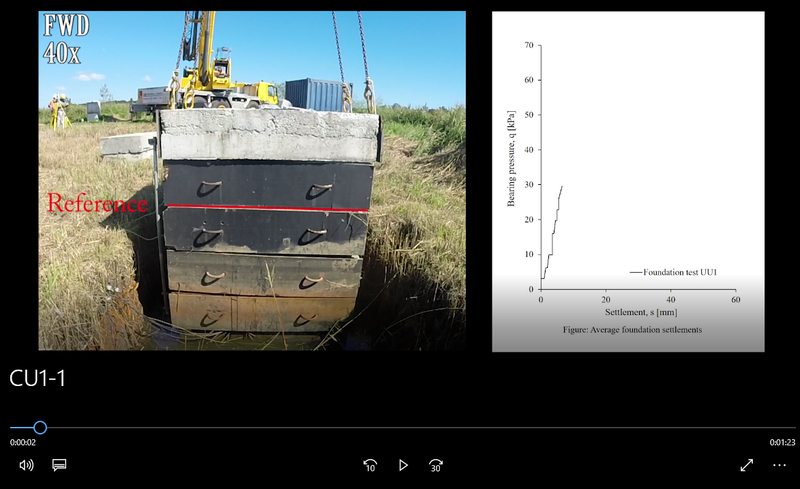 The video shows one of the instrumented shallow foundation tests at the Australian National Field Testing Facility (NFTF) being loaded to failure. More information of the NFTF, the shallow foundation tests and an accompanying international prediction exercise are available here .